#1 Best non-GMO Vitamin D Drops for KidsPremium Supplement TRIPLE-TESTED for Purity and Certified Kosher. Mom Approved, Made in USA and 100% free of: Gluten, Soy, Egg, Dairy, Corn, Nuts & Peanuts. Breast milk provides nearly every nutrient an infant needs (EXCEPT for vitamin D). As a mom, you protect your infant from too much sunlight -the most common source of Vitamin D (so it's critical to supplement their nutrition with Vitamin D drops). Vitamin D is not only for building healthy bones -it also helps to maintain strong muscles that support those bones! Studies show that Vitamin D helps healthy cells to grow in the body, and helps protect your childs lungs. In order for your child to receive Vitamin D, it must be supplemented into their diet. Choosing a healthy, pure liquid formula allows you to put a few drops per day into your child's bottle, cup, or meal -or even to simply put a few drops in their mouth. No fuss, no mess, nothing to chew and swallow. Did you know that most infants and toddlers don't get their daily Vitamin D requirements? Calcium & phosphorus absorption strengthens, protects, and reinforces growing bones during the constant falling during each new phase of balancing - learning to sit, learning to crawl, to stand, to walk, to run, to jump, to climb... as your child grows, their bones take more and more pressure. 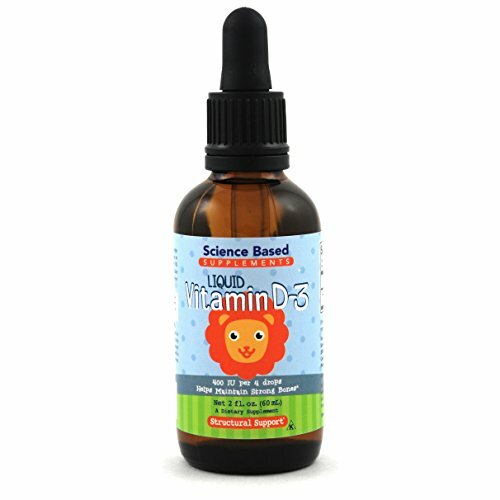 #1 BEST VITAMIN D3 DAILY SUPPLEMENT (Engineered for Kids) - Our unique formula provides the perfect amount of vitamin D, keeping your little one healthy and protected from weak, soft bones... without having to expose them to harmful UV rays of the sun. We call our liquid D3 drops "Science Based" because they are. We use only the purest ingredients, skipping the filler preservative ingredients and focusing on what studies show your infant, toddler, or growing child needs. VITAMIN D3 BENEFITS - Studies show that vitamin D3 (Cholecalciferol) helps your body absorb calcium and phosphorus to provide a healthy immune system. Vitamin D3 also reinforces and strengthens the muscles that support the bones in childrens' bodies. It also helps promote healthy cell growth, strengthens lungs, and protects vital organs. Vitamin D is one of the few supplements that isn't found in breast milk, or in fruits and vegetables. YOUR SAFETY COMES FIRST - Science Based Supplements LLC was founded to help provide premium natural specialty dietary supplements and nutraceuticals that will help you live a happier and healthier life. Every product is backed by solid research and development and we follow good manufacturing practices (GMPs) to make certain our supplements are produced according to the very best standards in the industry. MADE IN THE USA - We manufacture our Vitamin D3 drops in a (GMPs) certified facility in the United States to make certain our products are produced according to the best standards in the industry. Each bottle of liquid vitamin D3 drops are made with only the purest, most high quality product possible. YOUR COMPLETE SATISFACTION IS GUARANTEED - Our mission at Science Based Supplements, LLC is to provide the finest vitamins and specialty dietary supplements manufactured with scientifically validated ingredients. If you are not fully satisfied with our product, for ANY reason, please contact us immediately and we will do our best to correct the situation, provide a full refund or offer a credit that can be used for future orders. If you have any questions about this product by SunshineVitamin.com, contact us by completing and submitting the form below. If you are looking for a specif part number, please include it with your message.